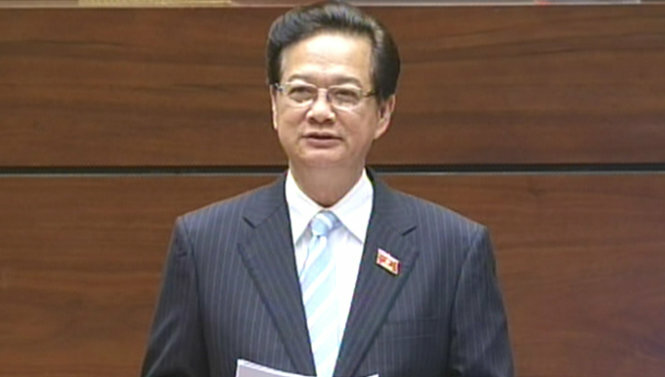 Vietnam's Prime Minister Nguyen Tan Dung is seen in this file photo. Vietnamese government leader Nguyen Tan Dung is heading a Vietnamese mission to the 5th Greater Mekong Subregion Summit (GMS) that is scheduled to open in Thailand’s Bangkok on December 19-20. Prime Minister Dung’s attendance at the two-day event is made at the invitation of his Thai counterpart Prayuth Chan-ocha. Vietnam will take the occasion to consolidate the Strategic Partnership with Thailand, while calling for support from the international community for joint efforts in the sustainable management and use of the Mekong River water, according to the Vietnam News Agency. As scheduled, PM Dung, along with other participants of the event, will take part in a banquet hosted by the Thai premier at 7:30 pm Friday. An official meeting between PM Dung and his Thai counterpart is scheduled to take place at 8 am on Saturday at Shangri-La Hotel in Bangkok. At 9 am the Vietnamese government leader will attend the opening session of the 5th GMS, along with other delegates. At 11:15 am a closed-door meeting of the summit will be held. PM Dung will later attend the debut ceremony for the VietJet Thailand joint venture at 2:30 pm the same day. He will later meet with the presidents of the Amata VN Public Company Limited and the Petroleum Authority of Thailand (PTT). He will also visit the Vietnamese Embassy and meet representatives of the Vietnamese community in Thailand before returning to Vietnam at about 4:45 pm the same day. The PM’s attendance at the 5th GMS shows the country’s support for the GMS mechanism and affirms the role and position played by the country in promoting sub-regional and regional links as well as the relations between Vietnam and other nations in the sub-region, according to the Vietnam News Agency. Established in 1992 under the initiative of the Asian Development Bank (ADB), the GMS consists of Vietnam, Laos, Cambodia, Thailand, Myanmar and China’s Yunnan and Guangxi provinces.